I am very interested in having my son home schooled. He is currently attending a private school's pre-primary. They are in a farm setting and their curriculum is based on "learn through play". We are planning to have another baby soon and I want to know if it would be advisable to let my son go on for now at the school and then say do Grade R still at the school and then when the baby is ready to go to creche which will be around the age my son will have to go to grade 1 - take him out and start to home school him then? Then we will have enough time in the morning to home school him and then just repeat the process with the next child. What I want to know in the end....is it better for me to start teaching him at home "the sooner the better" or leave him for a few more years? Will he find it more difficult to adjust to being home schooled if I leave it till after grade R? I would really appreciate your thoughts on this. He is a very social and well adjusted child. According to his teachers he is very mature for his age. He is the youngest in the class, most of the children have already turned 4 and he is on par with their skills....emotionally sometimes still visible that he is younger, but I suppose that is to be expected. My husband works away quite a lot and we are thinking that home schooling will make it easier for us to go away when we want to and spend time with my husband when we can and not be bound by school terms....and then there are many other reasons why we want to teach them ourselves. I am looking forward to your reply. Thank you so much for taking some of your time to get back to me. in motion by him being away from you during this time. back at home away from a crowd, whereas a child who is at home learns to amuse himself and entertain himself naturally, from a young age. This is a great lifeskill that many adults today lack. instead of being at school, wondering what he is missing out on. think that it is partly because they are with me and get all the mommy-attention they need. I always make them feel that they are GETTING A NEW SIBLING, something to ADD to their life, not someone who takes me away from them. socialization that could occur in a class situation. more confident about making your decision. What are you comfortable with? I have 3 kids, ages 6, 2, and 3 months. I began homeschooling my oldest this spring when I had my baby, after she completed most of kindergarten (for a number of reasons, irrelevant to your question). However, I still plan to send my 2-year-old to her "preschool" for three days a week next year. She is in a class of 5, and she absolutely loves it there. This gives her a chance to be with other kids her age, as well as learn how to behave when I'm not around and someone else is in charge. We still have plenty of time together, but I feel that this particular school with my particular child is a good match. So, it is really what you feel most comfortable with for your situation. These are your children to raise the best way that YOU can. And don't ever be afraid to change things up if it's not working for you and your kids. Try it one way, see how it works, and make changes accordingly. My oldest boy is almost 5years while the youngest is just over 2yrs. We have also decided to homeschool from next year. At the moment they attend a playschool 3 mornings a week only, but when they started attending the playschool was 50/50 (Afr/Eng). We are Afr. at home. Currently the playschool is 10/90 (Afr/Eng), and soon to be 100% English. Although both boys are fully bilingual (for their age), the mix in languages is basically causing confusion which will lead to me having to start from scratch with all the work - Afrikaans terms for alphabet and letter sounds, numbers, colours, shapes. My husband is starting to consider taking them out earlier, but I will have to wait and see. Research has shown that young children thrive when they have strong emotional attachments and spend a lot of time with their mothers. Preschools are good for those children whose mother's can't be there to care for them all day, but for children whose mothers are available, home with mom is best. 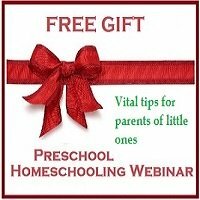 Don't let anyone convince you that your child needs to be at preschool more than he needs to be with you. Join in and write your own page! It's easy to do. How? 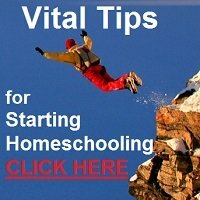 Simply click here to return to Homeschool Questions.